If needed, please contact Richard Andres & Deb Lentz at 2510 Hayes Rd. Chelsea, MI 48118 e-mail: tantrefarm@hotmail.com phone: 734-475-4323 website: www.tantrefarm.com. We try to keep the printed newsletter to a 2-page maximum, which means that we won’t list all the share items’ descriptions every week, but refer you to previous newsletters for information on items that have already appeared in your shares. If you are new to our CSA, since you signed up with a prorated share, you can find all past newsletters on our website under the NEWSLETTERS tab. RED ACE BEETS AND GREENS: round, smooth, deep red roots with sweet flavor and medium-tall, red-veined green leaves. See Week 6 newsletter for usage and storage tips. FRESH SHELLING BEANS (Tongue of Fire): Italian heirloom shelling beans are round, ivory-tan with red streaks in stringless, red-streaked cream/green pods (you will need to shell them to eat the beans, not the pods); nutty flavor and creamy texture when cooked; can be substituted in recipes calling for Cannellini, Great Northern, or Pinto beans; contain a fair source of vitamins A and C.
-How to use: fresh, shelled beans are good in soups, stews, and casseroles, but also delicious simply boiled until tender, and served with a little butter or olive oil, salt/pepper or herbs. -How to store: refrigerate fresh beans in a tightly covered container for up to 5 days. CUCUMBERS: long, cylindrical, green-skinned fruit of the gourd family with mild, crisp flesh. See Week 6 newsletter for usage and storage tips. FRESH HERBS: In general, store herbs upright with cut stems in 1 or 2 inches of water and refrigerate for up to 1 week or wrap in slightly dampened cloth or plastic bag and store in refrigerator. 1. Anise Hyssop—catnip-like, soft, sweet, anise-scented leaves are used as a seasoning, as a delicious licorice-flavored iced or hot tea, and in potpourri; it was used medicinally by Native Americans for coughs, fevers, wounds, and diarrhea. 2. Oregano—This member of the mint family is similar to marjoram, but not as sweet and more pungent, spicy flavor and aroma; good in soups and tomato-based dishes; medicinally can be made into tea for digestion difficulties. 3. Italian Flat-leaf Parsley—flat, glossy, dark green leaves have a strong parsley/celery flavor; especially good in omelets, scrambled eggs, mashed potatoes, soups, pasta and vegetable dishes, as well as, sauces to go with meat dishes. 4. Common Thyme—tiny green leaves used in meat and vegetable dishes and most casseroles, soups, stews, and medicinal teas, which soothe sore throats. 5. Black-stemmed Peppermint—superior fragrance and flavor; forest green leaves with deep purple veins and stems; leaves are good as a hot or iced tea, and adds a delicious flavor when minced and added to cooked peas, carrots, potatoes, and salads. 6. Tarragon—its flavor is delicate and almost licorice or anise-like; an essential herb in French cuisine; exceptional in egg dishes, poached fish, chicken, mushrooms, salad dressings and with other vegetables. **Genovese Basil—All shares will receive 1 basil with root, an herb with sweet, spicy, shiny, green leaves. We supply it with root attached, so it will last up to a week or 2 when stored in a jar, vase, or glass of water on your counter or table top. Do not refrigerate. It is a tropical plant and doesn’t like the cold. KALE: You will receive Red Russian Kale (the stems are purple, and leaves are deep gray-green, purple-veined, flat, non-curled, and tooth-edged) and Lacinato Kale (dark green, noncurled, blistered leaves, but heavily savoyed). See Week 4 newsletter for usage and storage tips. LEEKS: green leaves with white to pale green stems. Cooking tip: slit from top to bottom and wash thoroughly with root facing up to remove all of the dirt trapped between the leaf layers. See Week 6 newsletter for usage and storage tips. MUSHROOMS (Shiitake): flower-like cracking pattern on brown cap; edible mushroom native to East Asia; good in sandwiches and cooked–see below; many medicinal qualities too; grown on logs. If you don’t care for mushrooms, then leave them for someone else or gift them to a friend! -How to use: brush off dirt to clean or wipe with damp cloth, do not wash or submerge in water; good grilled, sauteed, steamed, in soups, and in sandwiches. -How to store: place in paper bag or wax bag and keep in refrigerator for up to 5-7 days. SWEET ONIONS (Ailsa Craig Exhibition): a huge, sweet, mild, yellow-skinned, heirloom onion that is well known by British gardeners who grow show-size onions. -How to store: not for long storage; wrap in damp towel or plastic bag in fridge for 2-7 days. POTATOES (Kerr’s Pink): very pale skin and cream flesh; mealy, cooked texture, so makes a good specialty/salad potato variety; good roasted, mashed, or in salads. See Week 7 newsletter for usage and storage tips. SUMMER SQUASH/ZUCCHINI: You will receive some variety of Green or Yellow Zucchini (gourmet golden or green zucchini with uniform, cylindrical fruits) or Slick Pik Summer Squash (long, yellow straight neck with good flavor). See Week 6 newsletter for usage and storage tips. CHERRY TOMATOES: You will receive a mixed pint of Sakura (bright-red, shiny, medium-large cherry tomato with real sweet tomato flavor) or Sun Gold Cherry (exceptionally sweet, bright tangerine-orange cherry tomato; less acidic than the red cherry tomato, so slightly less bland in flavor; popular as a garnish, in salads, or as a cooked side dish that can be sautéed with herbs) or Clementine (tangerine-colored, oval-round fruits; appealing, sweet-tart flavor. Exceptional when halved and roasted!). 1. 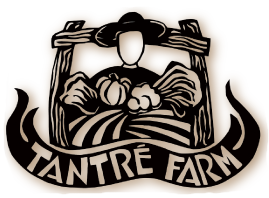 FAMILY FARM HIKE on Aug. 3: Come join us for a guided monthly exploratory walk around Tantre Farm on Friday, Aug. 3, at 4 PM. We’ll use all our senses as we take an approx. 45-60 minute hike with CSA member, Alisse Portnoy, who teaches at the University of Michigan. She and her daughter are in their ninth year of once-a-week, long visits to the farm. They look forward to sharing some of its treasures and treasure spots with you. Meet at the picnic tables behind Main House at 2 pm. 2. KIDS’ COOKING CLASS in August: We had so much fun on Sunday with our Kid Cooking Class that we are scheduling another one in August, so if you missed the first one perhaps you can make this one! We are still finalizing the date, but are thinking of a Sunday afternoon again or maybe a Monday early evening. If you have a preference, please feel free to let us know. Personal Chef Allison Anastasio Zeglis, from www.lastbitechef.com, will show you how to approach a CSA box, family style. Using a few classic techniques that can be adapted to a variety of vegetables, cook your way through a share box with your child. Get hands on experience as a dynamic duo tackling cooking projects and then enjoy eating them together at the end of the class. Please register with your NAME and your child’s NAME, child’s AGE, PHONE, and EMAIL ADDRESS. Please bring $10/person or $30/family, but if financial difficulties, please let us know. More details coming! 3. WEEDING VOLUNTEERS NEEDED: If you are interested in helping out, please contact us for any day of the week or evening. Ann Arbor Farmers’ Market (Sat.) –7 A.M. to 12 P.M.
Washtenaw Food Hub (Sat. )—9 A.M. to 12 P.M.
NEW! Argus-Packard (Sat) (limited site)–10 A.M. To 12 P.M.
Cook potatoes, covered in boiling salted water until tender; drain and mash (should yield about 1 1/3 cups). Cook cabbage, covered, in small amount of boiling water for 5 minutes, until tender; drain. In a bowl, combine eggs, butter, flour and seasonings. Add the potatoes; beat until smooth. Generously grease four 6-ounce ovenproof custard cups; spooning 1/3 cup mixture into each. Top each bowl with cabbage and cheese. Bake at 350 degrees for 30 minutes. Serve with yogurt and chives. Soak bulgur 20-30 minutes in cold water to cover. Drain well. Line a salad bowl with lettuce leaves and spoon in bulgur. Mix in 3 tablespoons of the parsley, mint, onion, and tomatoes. Whisk lemon juice with olive oil, salt and pepper; toss with salad. Sprinkle remaining tablespoon of parsley on top. Begin by adding olive oil, garlic, and baby leeks to medium saucepan with a pinch of salt. Sweat on medium heat. When leeks are soft, add the rest of the ingredients and simmer for 20 minutes. Adjust seasoning with salt and pepper and serve hot. Serve with grilled meats or alone with grilled bread. -To Cook Beans: Add cold water to cover, no salt, bring to a boil, lower the heat, cook gently till tender, and salt at the end. Takes about 20-30 minutes. -To Roast Tomatoes: Preheat oven to 425 degrees. Toss cut-up tomatoes in a large bowl with the olive oil, salt and pepper. Transfer to a baking sheet cut side up and roast until soft and juicy, about 20 minutes or less.